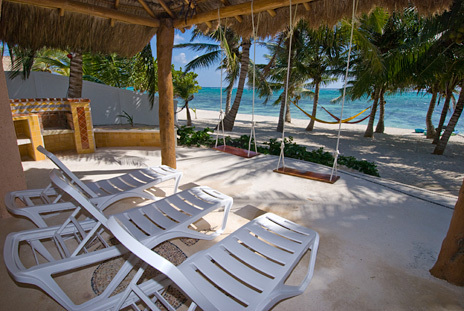 Lounge chairs, a glimpse of the built in barbecue, and look: patio swings! SPECIAL: 25% off stays from now through Nov. 16, 2018. Special applies to new reservations and is subject to change. Holiday and high season reservations require a 7 night minimum, Sat. to Sat. only. 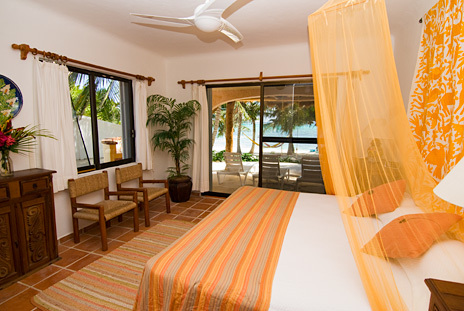 Low season reservations require minimum of 5 nights unless otherwise agreed. 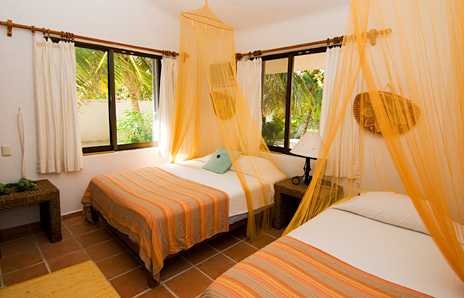 More about Casa Rosa . 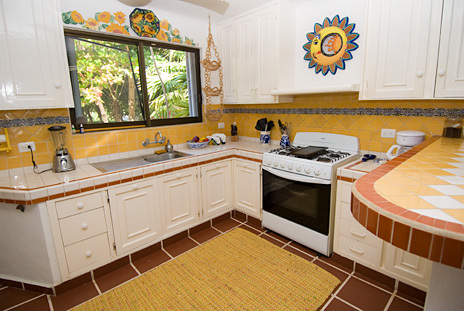 . .
Casa Rosa vacation rental villa on Tankah bay is a dream vacation property for friends or family. The beach is absolutely spectactular with sandy from the moment you step off your patio and into the waters of the sparkling blue Caribbean sea. 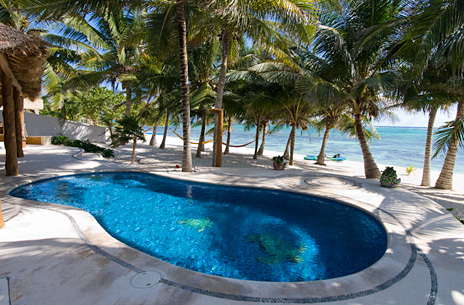 Lush coconut palms along the sandy shoreline provide a prime backdrop for this stunning vacation villa. 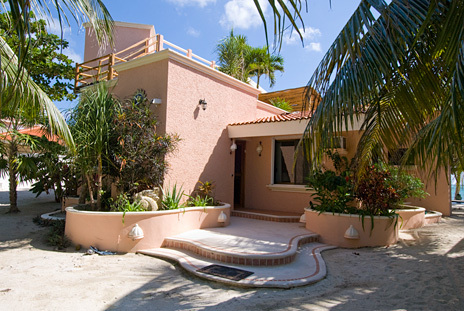 You'll love the many outdoor features of this vacation villa including sea kayaks to tour the bay, outdoor patio areas, two grills, an oceanside swimming pool, hammocks strung between palm trees, an outdoor patio dining area, huge second floor patio area and to top it off, a rooftop patio area. 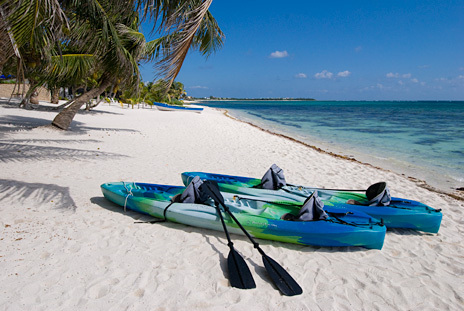 Without leaving Tankah bay, you have many activities to choose from: snorkeling in the manatee cenote just up the road, swimming in the bay or in your private swimming pool, snorkeling on the pristeen coral reef just offshore and long walks along the beach are just a few. 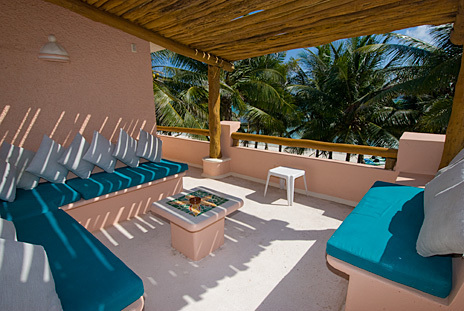 For your convenience, there are a couple of restaurants on Tankah Bay that you won't want to miss, including Blue Sky and Casa Cenote Restaurant. 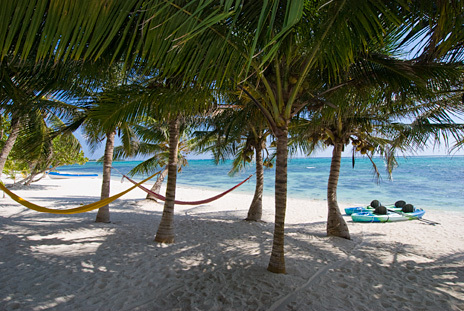 Other diversions within a ten minute drive are several ecological parks such Xel-Ha Nature Park and Hidden Worlds Cenote. 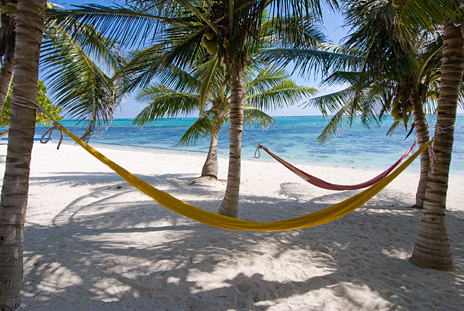 Mayan ruins of Tulum are within 15 minutes and a number of others are easy to see with daytrips to Coba or Ek Balam. Of course there are many, many other attractions along the coast with activities ranging from jungle tours, cave diving, zip lines and horseback riding. 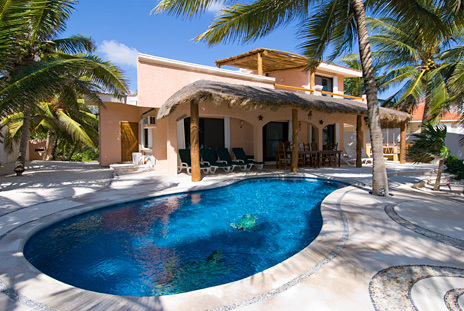 Casa Rosa has been a favorite vacation rental villa for years. It is a charming villa set amongst coconut palms and an incredible beach; it has everything on a vacation goers' wish list. The tiled beachside pool and stunning turquoise waters of the Caribbean complete this tropical paradise. 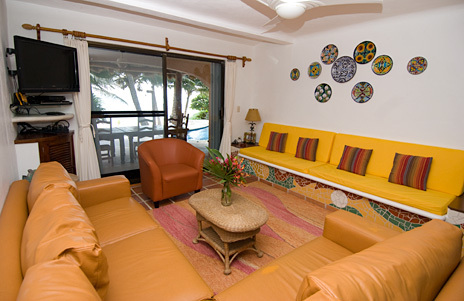 Inside the Casa Rosa are all kinds of creature comforts including satellite TV, internet (bring your laptop), CD player, safe for valuables and Vonage phone service with free calls to the US and Canada. 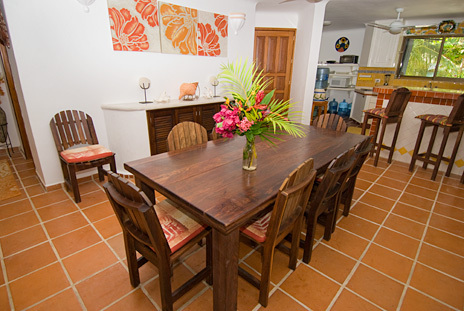 On the main level is a spacious kitchen where you can prepare snacks or complete meals. 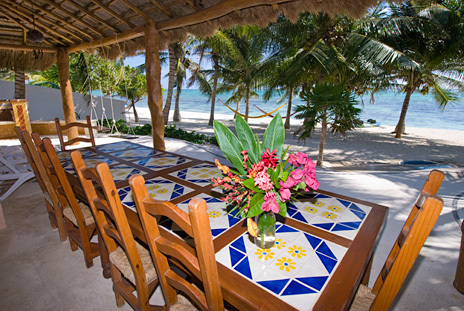 Or, leave the cooking to the staff at Casa Rosa; they can prepare traditional Mayan meals, breakfast or afternoon appetizers (you pay for the groceries and tip them appropriately). Also on the main level is an open living and dining area. 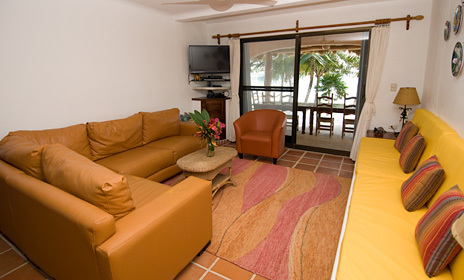 This is a comfortable and airy space with easy access to the beachside swimming pool and patio lounge areas. In addition, three of the four bedrooms are located on the main level: 1) a master suite with king sized bed, private bathroom, and private, screened glass door with views and access out to the garden and ocean; 2) a junior suite with a king sized bed, also featuring a screened glass door with views and access out to the garden and ocean, this room shares a bathroom with the following; 3) a ground floor bedroom with a queen sized and a single bed, lovely views of the lush garden and a shared bathroom. 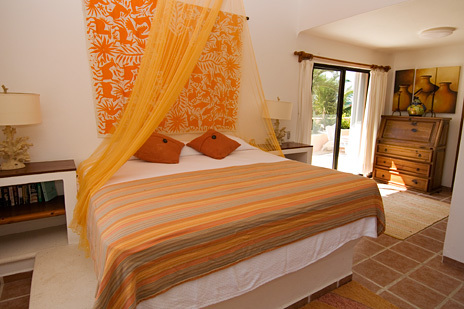 On the second level is another master suite with incredible views, king size bed and private bath. 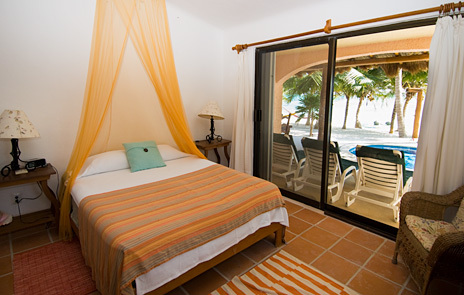 This bedroom has sliding glass doors to a large patio area adn rooftop patio. 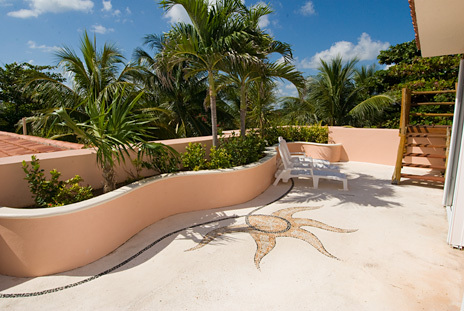 The rooftop terrace offers spectacular views of the Caribbean and is a comfortable place to your friends and family, watch the stars, or soak up the sun and tropical breezes.